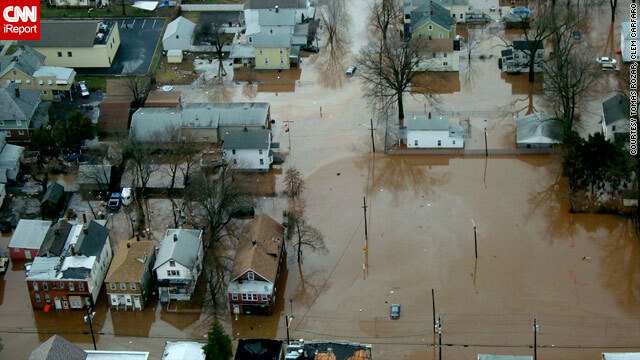 CNN iReporters Tomas Rozar and Clem Carfaro provided this aerial image of flooding in Bound Brook, New Jersey. (CNN) -- Facing near-record floodwaters, Red River communities in Minnesota and North Dakota raced Tuesday to shore up levees and dikes, officials said. "We're in the full flood fight mode here," Fargo, North Dakota, City Administrator Pat Zavoral said. Last week, warm weather and rain melted snow south of Fargo and Moorhead, Minnesota, causing the Red River to swell as it flows north. Upstream, snow and ice have yet to melt, pushing water back toward the two cities. Forecasters predict the river will crest Saturday about 20 feet above flood stage. Last year, the river rose to a record 40.8 feet at Fargo. "We have every contractor we have in the area on a 24-hour shift, preparing dikes, hauling dirt, delivering sandbags," Fargo Mayor Dennis Walaker said. "We have never lost a flood fight here in Fargo," he said. "We're going to be optimistic about this for the rest of the week, that we're going to be able to save our community one more time." Volunteers have answered the call to fill 1 million sandbags this week, Zavoral said. "We're putting up temporary clay levees, and we've produced sandbags, and we're delivering them to the low-lying neighborhoods," he said. Early Tuesday, the river level stood at 27.6 feet, according to the National Weather Service. Flood stage is 18 feet, according to the service. "We thought we had a couple more weeks, and with the weather and the quick thaw and the rains we've had recently, it's really made it more difficult and it's really sped up the crest," Fargo police Sgt. Carlos Nestler said. Residents in Fargo and Moorhead are busy building sandbag dikes along the river's edge. Fargo's Kurt Kaye is doing what he did last year, helping friends protect their home from the rising Red River, which runs through their backyard. Like most residents, he said he's resolved to keep the water at bay. "I think everyone is a little tired of it, but they'll get behind it and go," he said. "They need to get it done to save their houses." Zavoral, the city administrator, said Fargo is better prepared this year to deal with a major flood. "We've spent about $10 million putting in permanent flood protection in some of the neighborhoods and bought out about 26 homes in the low-lying areas," he said. City officials have said they believe they'll need about 1 million fewer sandbags than were used last year. Meanwhile, along the Eastern Seaboard, flooding fears eased as a powerful nor'easter pushed into the Atlantic Ocean, though scattered flood warnings were in place from the mid-Atlantic states to Maine. Thousands of customers remained without power in the Northeast after rain and hurricane-force winds whipped the region over the weekend. At least seven deaths were attributed to the storm, five caused by falling trees, authorities said. Two people died in New Jersey. Authorities from Connecticut, New Hampshire, New York, Rhode Island and West Virginia said they each had one storm-related death. The outages were caused mostly by power lines downed by Saturday's winds, which knocked over trees and utility poles. Winds reached 75 mph at New York's John F. Kennedy International Airport -- as strong as a Category 1 hurricane. CNN's Steve Kastenbaum contributed to this report.